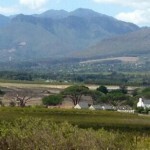 A lovely 10 ha boutique micro-estate situated on the slopes of the Stellenbosch Hills. Run by a husband and wife team who create delicious wines on a tiny scale, with passion and commitment. Focusing specifically on Pinotage, Merlot and Cabernet Sauvignon their wines seriously over-deliver for the price. A perfect example of why boutique wines trump the big brands for value for money.